The QIX associative data engine makes dealing with multiple, concurrent data sources easy and powerful. Excellent extensibility through powerful APIs. Powerful and easy to use data visualization tools with access to external graphical libraries if needed. QlikView as a production oriented, developer focus platform, and Qlik Sense for self-service analytics. Very slow to accommodate advanced analytics, and particularly support for R and python. Low levels of innovation, and in danger of being left behind. Slow to move to the cloud. Qlik offers a solid portfolio of products to address mainstream business intelligence needs. The stars of the show are its associative data engine and the excellent levels of extensibility. The QIX associative engine makes the job of combining data from disparate, multiple data sources particularly easy, and automates tasks that are time consuming in other platforms. QlikView is the more mature of the platforms offered by Qlik, and this is primarily targeted at the production needs of the business. Qlik Sense on the other hand is a direct competitor for Tableau and other contemporary self-service analytics platforms. It offers excellent ease-of-use features, with the mandatory drag-and-drop interface. On the other hand Qlik has been slow to move to the cloud, and although it does have cloud offering for Qlik Sense, this is not really production ready, and is mainly suitable for small workgroups. Qlik NPrinting for advanced report generation and distribution. This is more important than many realize, since many contemporary BI products do not support paginated reporting – but businesses still need it. Qlik DataMarket is a data as a service (DaaS) product providing a large library of data sets to complement a business’s own data. Qlik Connectors extend the data sources Qlik can access. Qlik Analytics Platform is primarily targeted at OEMs who wish to embed analytics into their own products. It gives access to the QIX data engine and the visualizations via various APIs. Businesses who need a platform that deals exclusively with traditional BI needs and self-service analytics will find Qlik to be attractive. However the world is moving on and Qlik seems to be slow to respond. This may be because of the acquisition of Qlik last year by Thoma Bravo – a deal worth approximately $3 billion. As a private owner Thoma Bravo may be less inclined to invest in the product, or it may be that the company is taking a different direction. Either way the net result is that competitors are starting to move ahead of Qlik. The most notable example being that of advanced analytics. Products such as Spotfire offer easy to use advanced analytics (clustering for example), as indeed does Tableau. Most contemporary BI platforms also provide integration with the analytics languages R and python, for more complex analytical tasks. In many cases this integration is transparent, and in the case of suppliers such as Sisense, users may be using R functionality without actually knowing it. Qlik would be the choice for businesses which have no ambitions to go beyond traditional BI analysis. While this may not be entirely wise, it will appeal to organizations that see BI as an island in itself. There are some warning signs that in a broader context Qlik is slipping, unable to modify its world view in the face of emerging technologies such as machine learning, AI, IoT and natural language interfaces. All of these will impact upon BI, and all BI suppliers need to accommodate them, or be left behind. Cloud BI. It is reckoned that within a couple of years around a third of BI implementations will be in the cloud – and we are talking large enterprise deployments here. This will obviously benefit suppliers such as Birst, and others such as Spotfire that have mature cloud offerings. Qlik does have a cloud platform, but it is hardly suitable for enterprise deployments. Qlik Sense Cloud is offered free for workgroups of five or less users. Obviously Qlik is seeding the market, but it does need to deliver something more substantial. There is talk of this being the case – but no concrete offering at the time of writing. Artificial Intelligence. Proliferation of data sources, visual representations, and analytical techniques means users need help, and it is coming in the form of AI. A good example is the use of Natural Language Generation (NLG), a method increasingly driven by AI, where commentary is produced that picks out the most salient features from analysis. Qlik does have a relationship with Narrative Science and Yseop to produce such commentaries, but it will need to do more. BeyondCore (now part of Salesforce) will automatically cycle through millions of combinations of data sources, representations and analytical techniques to produce significant analysis. All Bi suppliers will have to follow this lead. Advanced Analytics. Qlik is due to release an integration with R and python some time this year – but it is very, very late. There are no in-built advanced analytics within Qlik products, making it uncompetitive with products such as Tableau, Sisense, Spotfire and others. BI, machine learning, AI, prescriptive analytics and other forms of analysis will inevitably converge, and Qlik needs to be accommodating them. Charts and graphs are only a small part of the analytical process. Even IBM with its Cognos platform has integrated Watson analytics to enhance the analytical experience. And so Qlik is playing a dangerous game with its slow response to BI market dynamics. The following applies to Qlik Sense, the self-service platform. 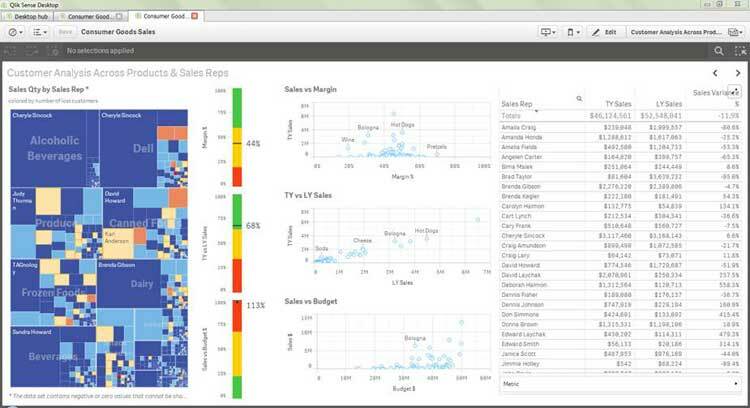 Qlik Sense Desktop is the entry level product, and it can be freely downloaded – the full version. Out of the box it easily connects to desktop data sources such as Excel and CSV files. If users want to connect to remote or local databases they have to do a bit more work. The Data Load Editor allows other sources to be specified, and a ODBC connector is also available. Once data can be accessed it is loaded into the in-memory associative data engine, where it is compressed for speed. Performance is very good provided the data fits into memory, and since it is compressed, an awful lot of data can be accommodated. Virtually every kind of chart is supported. The central construct in Qlik Sense is the sheet – this can contain charts, tables, images and filters. A sheet can consist of many visualizations. The desktop version supports the distribution of visualizations via file. To add to the appeal of the desktop version, and to whet the appetite, Qlik Sense Cloud allows users to upload visualizations and share them with up to 5 users – again for free. The data exploration capability is helped considerably by the associative engine. This color codes data sources to indicate the relationship they have with data sources already being used. Green indicates a data source is already being used, white means there is an association (which you may not already know about), and gray indicates there is no relationship. The server based Qlik Sense Enterprise provides similar capability to the desktop version, but with added collaboration features, scalability, data management, governance and platform management and a distributed architecture. Users get full functionality through a browser based interface – even on mobile devices. Visualizations can be created, viewed, shared and managed through this single interface. Clever resizing of charts and objects means visualizations fit on almost any device display – a natural outcome of the fact Qlik Sense was built ground up for mobile and touch devices. Qlik Sense Proxy manages sessions, handles load balancing, handles identity (e.g. Active Directory), and is essentially the entry point for users coming in through the Hub, or via the Management Console. Qlik Sense Engine is in many ways the heart of the system, with its in-memory columnar database. It is RAM based and delivers visualizations, search results and run-time calculation to users. Qlik Sense Scheduler coordinates the loading of data, and looks after time based reloads and data dependencies. Qlik Sense Applications comprise data, a data model and the presentation layer. These are loaded by Qlik Sense Engine. The Management Console is for admin to manage data connections, security, auditing and other matters. A deployment console gives access to the deployment environment (Qlik Sense can run in virtual machine environments – VMware vSphere, and Amazon AWS). These are the main components and they provide great flexibility. It means Qlik Sense can scale in almost any manner needed, and multinational businesses can split components over different regions, if needed. Qlik Sense API to build new visualization types. Qlik Sense Mashup API/.NET SDK to embed visualizations and other functionality. Qlik Sense Engine API for direct communication with the associative engine. Management of the environment is aided by a shared object library for pre-built data, expressions and visualizations. Access to resources can be tuned to user skill level, and access to data sources controlled by security rules. Streams allow fine control over who gets access to a visualization, and in which modes (read, update, modify, delete). The management and governance environment provided by Qlik Sense provides everything a large (and not so large) organization might need. OEMs can use the Qlik Analytics Platform, a new offering that allows developers to embed Qlik visualizations into applications through web mashups, or by embedding into custom applications. It includes the same core QIX analytics engine that Qlik Sense is built on and the full suite of product APIs.